Take a behind the scenes look at Gabrielle Nankivell's Ghosts of Berlin. With film documentation, both in studio and in situ in Berlin, as well as descriptions and thoughts illustrating the processes, Gabrielle takes us on a tour of her creative journey. Gabrielle Nankivell‘s new work development - Ghosts of Berlin. Gabrielle Nankivell has completed her Fellowship program which included a creative development for the new work Ghosts of Berlin at adaStudio (Berlin) and participating in Tanzlabor_21’s Summer Lab (Frankfurt). In developing Ghosts of Berlin, Gabrielle collaborated with Laurie Young, a choreographer/dancer based in Berlin, and Raul Maia, a performer and dance maker based in Vienna. The work was presented to the public on 23 August as a work-in-progress at the Nah Dran event at adaStudios. Ghosts of Berlin creates a performance fiction from a loosely autobiographic thread. Tracing a personal history spanning the early 2000’s till today, in response to the historical blueprint of Berlin, it examines the impact of our lived history on both imagination and our experience of time. In a reality where we are all documentarians, it generates a unique history of person and place. Following her residency in Berlin, Gabrielle travelled to Frankfurt’s Tanzlabor, here she worked with leading directors/choreographers, including Lia Rodrigues and Silvia Soter from Brasil, alongside other young dancers and choreographers from all over Europe. 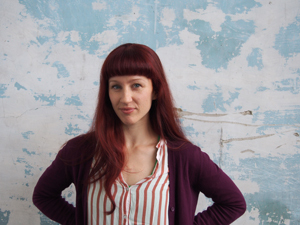 The Tanja Liedtke Foundation is pleased to announce South Australian dancer and choreographer Gabrielle Nankivell as the winner of the 2015 Tanja Liedtke Fellowship. Building on her extensive career as a dancer in Australia and Europe, Nankivell is beginning to establish herself as a choreographer with her recent work Wildebeest being presented in 2014 by Sydney Dance Company as part of its New Breed season. Gerlinde Liedtke, chair of the Board of Trustees said, ”We are delighted to award the 2015 Tanja Liedtke Fellowship to Gabrielle. She is a remarkable artist - unafraid of challenge, totally committed to finding new levels of excellence in her craft and at the same time very generous and respectful in the way she collaborates with other artists”. Nankivell was chosen by the Foundation’s Board of Trustees from an exceptional field of candidates from all over Australia. This bi-annual award has now been presented four times since it was initiated in 2009 to honour the dancer and choreographer Tanja Liedtke who at the time of her tragic death in a road accident was the Artistic Director designate for the Sydney Dance Company. The program includes a three week creative residency at adaStudio in Berlin, where Nankivell will work with two Europe based dance artists and have the chance to show her work to an invited audience. The residency coincides with Berlin’s international contemporary dance festival Tanz im August. After her stay in Berlin, Nankivell will travel to Frankfurt where she will take up a place in the Summer Lab at Tanzlabor_21, Frankfurt’s central hub for independent contemporary dance theatre. “I am so delighted to receive this wonderful opportunity to explore and create, supported by and representing a Foundation whose vision I wholeheartedly share. I’m also looking forward to the invigorating environment of artistic and cultural exchange in Germany. I thank the Foundation’s Board of Trustees for giving me the opportunity to represent Australian dance practice through this unique fellowship program. I can’t wait to see the results of this upcoming adventure unfold”, said Nankivell. Tanja Liedtke was one of the dance world’s brightest stars. Not only was Liedtke talented, she inspired many of her peers to envision their dream, seek out challenges and tackle them head on. The Fellowship is offered in light of Liedtke’s inspirational legacy. Nankivell follows previous Fellowship winners Antony Hamilton (2009), Katarzyna Sitarz (2011) and Joseph Simons (2013) in winning this prestigious award.